The X Bangsar is a contemporary bar & grill located in Bangsar. It is just right opposite Bangsar Village 2 so I suggest that you park inside the mall because parking is never easy in Bangsar. The X Bangsar was spacious but not huge, the restaurant and bar is nicely decorated win dim lights and it comes with a touch of modern finishing, it is also separated into 3 sections, indoor, outdoor and there is a nice sofa area right behind the DJ's deck. The X Bangsar serves a variety of food from Western to Japanese and they even have a few of our local Malaysian dishes available! Their range of cocktail and drinks are amazing as well, definitely returning for more! I also noticed that their servings are pretty big, so if you're thinking to throw a party or happy hour after a long working day, this bar & grill will be perfect the perfect place to come to! 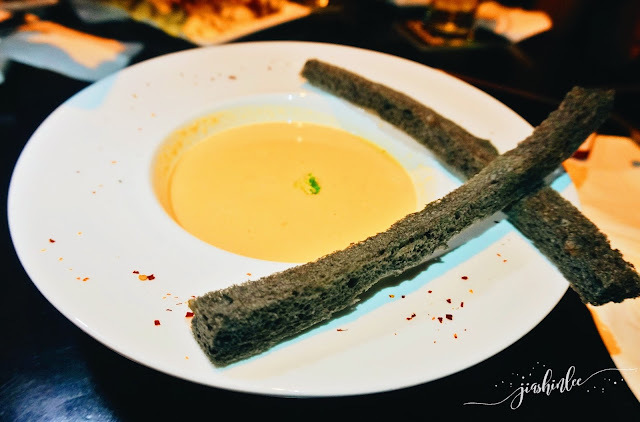 The bisque is simple yet rich with lobster flavour, it was served with charcoal bread sticks. My absolute favourite, if you love a refreshing yet appetising salad this is it. Served with fresh greens, strawberries, pear and the star - smoked duck and dress with a citrusy dressing. 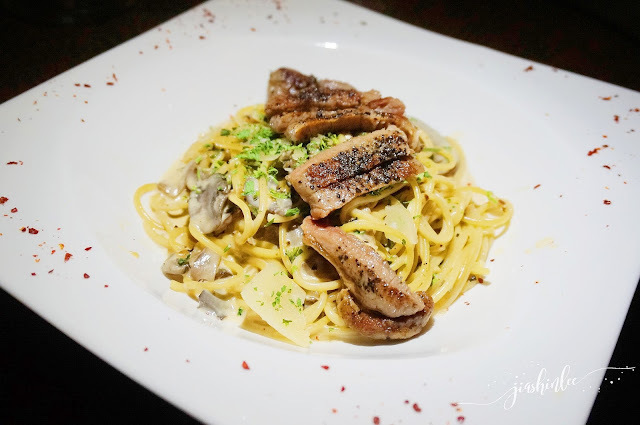 Mouthwatering steak on a bed of spaghetti with the most explosive flavour for your taste buds! Great for those who can't decide between pasta or a steak! Truly great lamb flavour, these chops were given a good seared both sides. Comes with black pepper sauce, salad and roast potatoes. 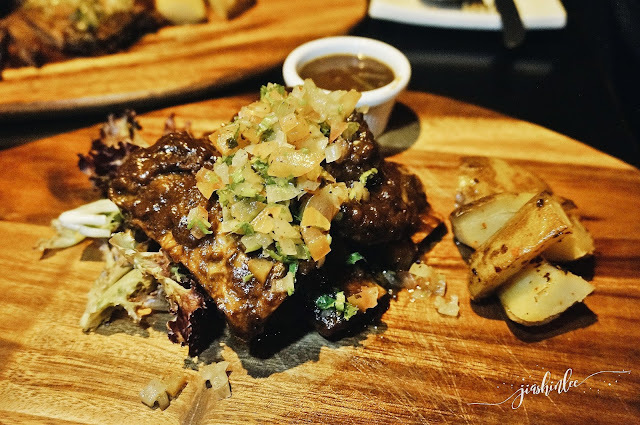 Tender beef ribs glazed with generous bbq sauce, the well-cooked beef ribs can be pulled easily off the bone, the ribs are served with sides of salad and roast potatoes. 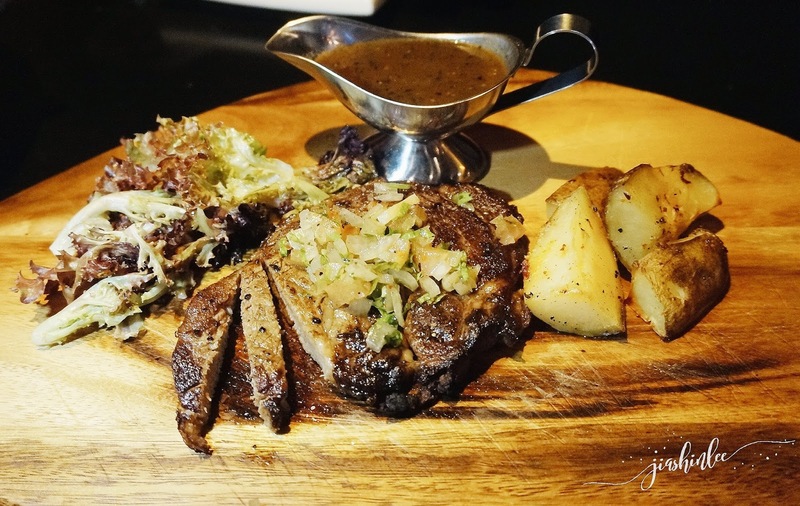 The perfect steak - medium cooked sirloin steak, the steak was flavourful and tender, pair it with some black pepper sauce, salad and roast potatoes. 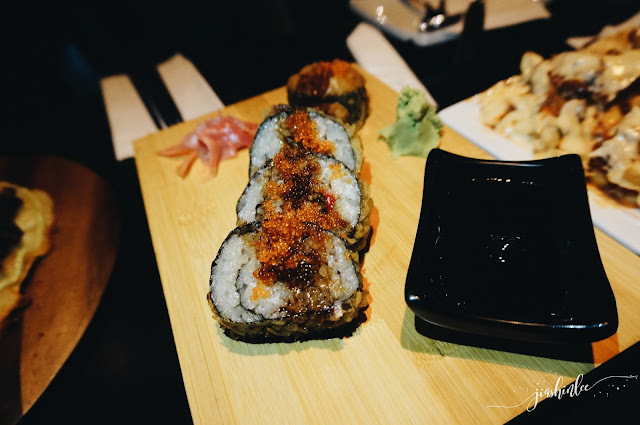 If you would like something light yet and tasty try this Japanese Roll which is as good as the ones in any Japanese restaurants. A must try! Baked thin crust pizza with a generous amount of cheese topped with salad, smoked salmon, avocado, lots and lots of roe and Japanese mayonnaise. A really addictive snack! Nachos with lots of melted cheese on top served with fresh guacamole and sour cream. It was really appetising I just couldn't stop eating it. Perfect for sharing! Nothing could go wrong with fries topped with chilli and a generous amount of melted cheese. These are so good, just pop these creamy buttery chicken fillets in your mouth! Thank you The X Bangsar for the scrumptious dinner! 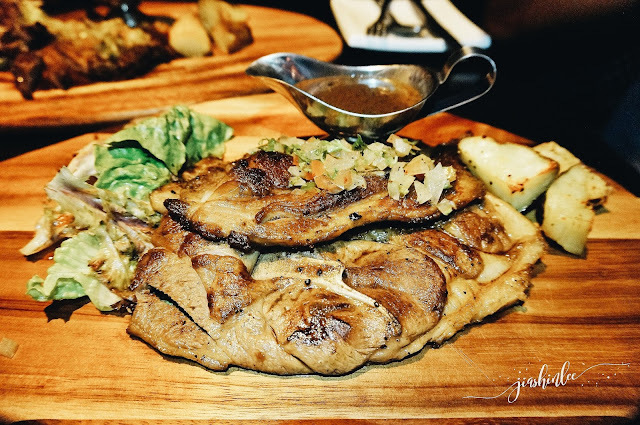 It was a great pleasure being able to taste all that great food and drinks on your new menu! I certainly would recommend this for those who would like to have a great meal and enjoy your drinks afterwards! 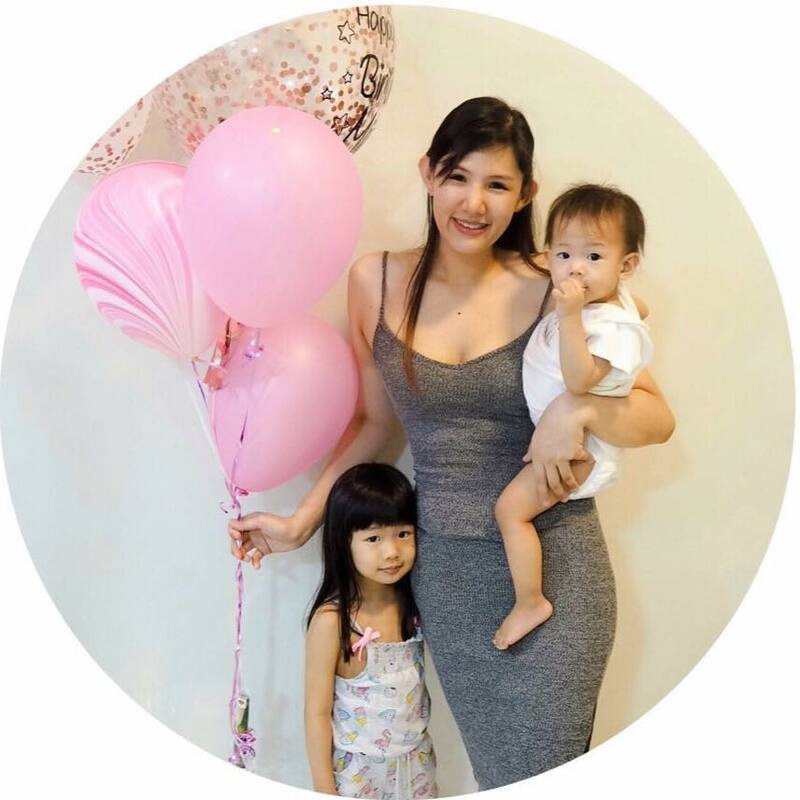 67, Jalan Telawi 3, Bangsar Baru, 59100 Kuala Lumpur. The preparation seems so yummy.. Got to try the smoked duck..
Nice bar and grill. Love the menu selection. Look delicious! Those charcoal bread sticks with lobster bisque look interesting! Smoked salmon pizzas are so tasty and filling too. Nice spread. Cheers!! omg! all the food looks so good! but i really want to try the Lobster Bisque! i guess this place best for gathering with besties! I'll take them all except for the beef! Bangsar is convenient for me to go from KL Sental. The place looks great! Perfect for a romantic dinner or night out with friends. Can't wait to visit this! Thanks for sharing! Brilliant food and the portion is generous. I want to try their cocktail and lamb chop nxt round. Their cocktail indeed is first class. Thumbs up! Looks delicious!! So wish i can drop by to try the food soon! oh my god!! I am interested to the Lamb Shoulder Chop!!! And all the foods looks so delicious!! I am tempted to try their Spicy Uramaki and salmon pizza. The place is quite near my house actually.